LIM College fosters a unique connection between real world experience and academic study in business principles. A LIM College education empowers students to become accomplished professionals in the dynamic global fashion world. Nearly eight decades ago, Maxwell F. Marcuse, an authority and pioneer in the fields of education and retail, was asked by leading retailers to create an educational institution for the business of fashion and merchandising. In 1939 Mr. Marcuse founded what was originally known as the Laboratory Institute of Merchandising (LIM) and in 2009 became LIM College. Founded by Maxwell F. Marcuse (as the Laboratory Institute of Merchandising) and was initially located at 45 West 34th St.
Seventy-nine women comprise the first graduating class. 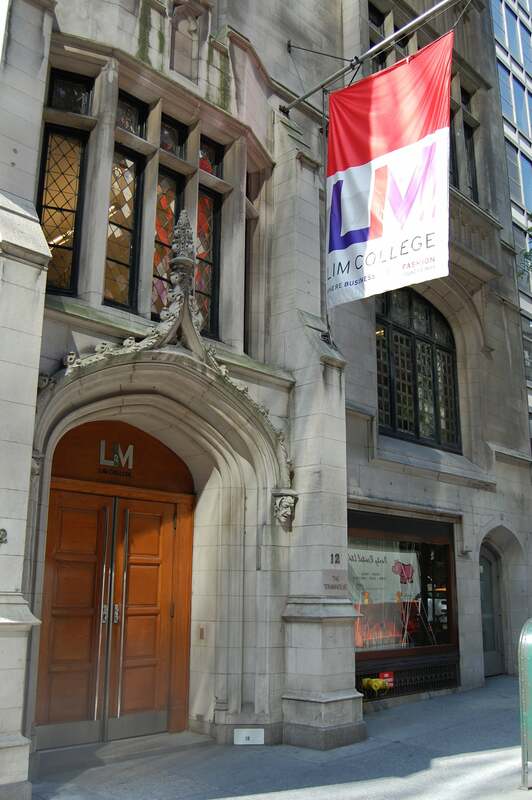 LIM College moves to The Townhouse at 12 East 53rd St.
LIM College officially becomes co-ed. Second generation: Adrian G. Marcuse assumes the presidency. LIM Fashion Education Foundation is founded. LIM College is granted accreditation from the Middle States Commission on Higher Education (MSCHE). Bachelor of Professional Studies degree granting powers are authorized. Bachelor of Business Administration in Marketing is approved. Third generation: Elizabeth S. Marcuse assumes the presidency. Bachelor of Business Administration in Visual Merchandising is approved. Maxwell Hall location opens at 216 East 45th St. Bachelor of Business Administration in Management is approved. Fifth Avenue location opens at 545 Fifth Avenue at 45th St.
Master of Business Administration degree granting powers are authorized. Name of institution officially changes from Laboratory Institute of Merchandising to LIM College. LIM College’s Townhouse at 12 East 53rd St. designated as a New York City landmark. Master of Professional Studies in Fashion Merchandising and Retail Management is approved. Undergraduate and MBA degree programs receive accreditation from the Accreditation Council for Business Schools and Programs (ACBSP). Master of Professional Studies in Fashion Marketing is approved. Bachelor of Science in International Business degree granting powers are authorized. Master of Professional Studies in Visual Merchandising is approved. Master of Professional studies in Global Fashion Supply Chain Management is approved. Bachelor of Science Degree is introduced. Online degree programs are offered. LIM College celebrates its 80th anniversary. Here are a few words of inspiration from LIM College President Elizabeth S. Marcuse. The Leadership Team of the College is comprised of the President, Executive Vice President for Finance and Operations/Treasurer, Provost, and Senior Vice President for External Relations & Alumni Affairs. The Board of Directors is the governing body of LIM College and establishes the basic policies that set the course of LIM College. The Board is responsible for the performance of the institution, in all of its aspects and has the fiduciary responsibility for LIM College’s financial performance. Composed of a maximum of eleven members, the Board meets quarterly at LIM College and participates in commencement each May. The Fashion Industry Advisory Board helps LIM College fulfill its mission and strengthen many of the services the College provides for its students. It is composed of successful senior executives from a broad variety of areas in fashion and related industries which currently include manufacturing, licensing, accessories, luxury brands, international sales, store design, public relations, marketing, executive recruiting, merchandising, supply chain and retail management. The mission of the Advisory Board is to assist and advise the College in areas that include, but are not limited to, curriculum, student advocacy, long-range planning, industry outreach and public relations. In that capacity, Board members are mentors to our students, host field trips to their businesses, guest lecture in classes, hire our students for internships and permanent jobs, provide curricular advice and suggestions for new programs and/or degrees to help LIM College identify emerging areas of study. They also attend and participate in special events at LIM College throughout the year. At LIM College, you’ll learn from faculty who understand the fashion business inside and out, as well as liberal arts professors who will teach you to think critically and communicate clearly. Dedicated to helping students achieve and succeed? You found the right place.